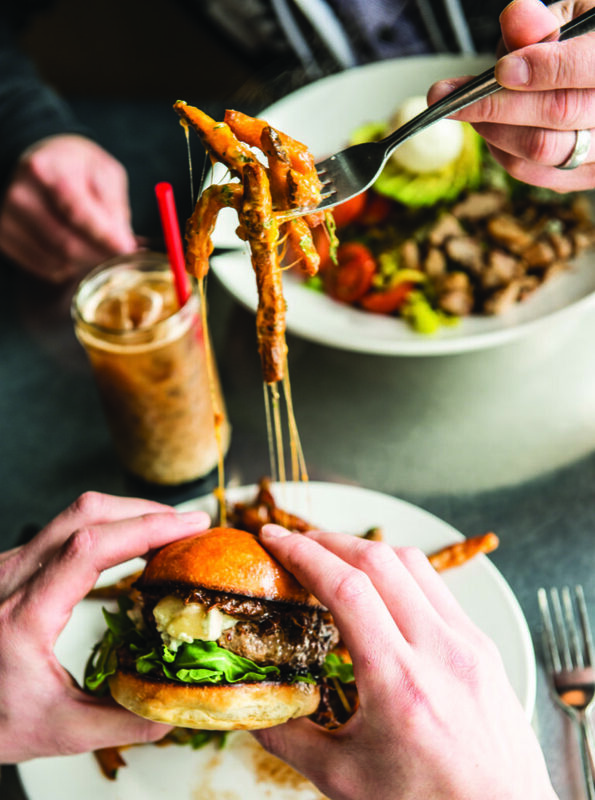 While Seattle (happily) doesn’t see the bone-chilling temperatures of some other cities, there’s still something about cold-weather months that cries out for cozy spaces and downright delicious comfort food. In Pike Place Market, crowds queue up at Beecher’s Handmade Cheese (*1600 Pike Pl; beechershandmadecheese.com) for its famed mac and cheese, a creamy combination of its Flagship and Just Jack cheeses (the mariachi mac and cheese version kicks things up with Anaheim chiles). Hidden away upstairs in the market is Radiator Whiskey (94 Pike St; radiatorwhiskey.com), a den of brown liquor and hearty dishes. One listed simply as “tots” starts as a bowl of crisped tater tots and finishes with a runny-yolked fried egg and mustard-based gravy on top, adding intrigue and grown-up flavor to all the richness and carbs. In the beach town–esque neighborhood of West Seattle, another whiskey-loving establishment is known as Seattle’s temple of fried chicken. The birds at Ma’ono (4437 California Ave SW; maono.springhillnorthwest.com) are soaked in buttermilk and fried twice to deliver both juicy meat and a crunchy crust. Chickens—order in advance, as they often sell out—come with kimchi, rice, and a punchy chile sauce. Meanwhile, over in South Lake Union, Serious Biscuit (401 Westlake Ave N; seriouspieseattle.com) stuffs fried chicken inside a fluffy biscuit topped with peppery gravy. The biscuit counter, part of local chef Tom Douglas’s empire, serves a lineup of biscuits garnished with everything from bananas, honey, and peanut butter to crispy ham hock and collard greens. The city’s broadest lineup of comfort food, though, is at Skillet Diner (1400 E Union St and 2034 NW 56th St; skilletstreetfood.com), where cornmeal waffles are topped with maple-braised pork belly and poutine with gravy and melty cheddar. The sleeper hit is the mighty grilled cheese sandwich, a feat of fluffy toasted brioche packed with brie, cheddar, and American cheeses. With these hearty dishes in your bellies, you’ll have ample fortification for even the chilliest of days.